I recently reopened a project after having just closed it, and now my game view no longer seems to be using HDR, even though it is turned on on my Camera. I can turn up the bloom, it does increase, but it's only visible in my game view when I have increased it so much it looks extreem in my scene view. Emission doesn't seem to be showing up, but when I turn it off in the material the object goes very dark, so I guess it is working. HDR toggling makes no discernable difference to the Game view, but seems to make the Scene view turn exactly like the game view is, so my conclusion is that my camera is not rendering HDR, but I can't think why? (and I could be wrong?). Anyone know what might have happened? No difference if I choose the deferred or forward rendering path. AllowHDR is set on the cam and in the project settings. Turning HDR off makes the SceneView look exactly like the GameView. In release build the problem persists. Also there is no difference in using OpenGL, DX9 or DX11 Color space is linear, in gamma space scene view looks just like the game view. Scene Camera properties and Game Camera properties are the same..I just checked. Tried HDR on the Standard Asset Examples, same problem, so its across projects. I have absolutly no idea why HDR is not showing up on my GameView, so disappointing..the SceneView looks so much better. 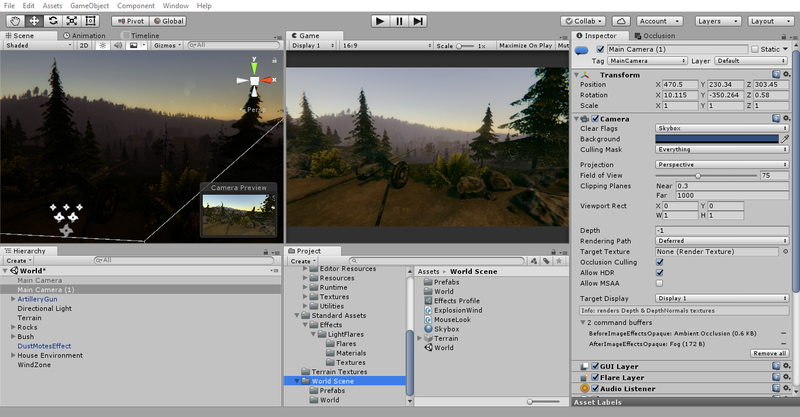 Unit version is Unity 2017.1.1f1 Any help is much appreciated. I'm getting the exact same problem. Scene view camera is showing hdr bloom ( for emiision with >1 values ) but actual hdr enabled main camera doesn't. I'm on 5.6.2f1 using the current post processing stack on the asset store. Does it appear dark or correctly when you build and run the game outside of the editor? No unfortunatly the problem persists. Can you confirm the same behaviour in the Frame Debugger? Under Tier Settings, check Use HDR for each tier. If a tier is grayed out, uncheck Use Defaults. The work around I have found is to change the settings for the project from 2D to 3D. Doing this gets rid of the problem for me, although it still occurs anytime I create a new project as 2D or set an existing project as 2D. Can others confirm that this behavior is the same for you? hm, no I have that problem only in 3D, didn't test 2D yet. Yup, that fixed it. How weird that 2D mode seems to force HDR Camera's off.